Siódma część przygód Harry'ego Pottera w oryginalnej wersji językowej. "Harry has been burdened with a dark, dangerous and seemingly impossible task: that of locating and destroying Voldemort's remaining Horcruxes. Never has Harry felt so alone, or faced a future so full of shadows. But Harry must somehow find within himself the strength to complete the task he has been given. He must leave the warmth, safety and companionship of The Burrow and follow without fear or hesitation the inexorable path laid out for him? In this final, seventh instalment of the Harry Potter series, J.K. Rowling unveils in spectacular fashion the answers to the many questions that have been so eagerly awaited. The spellbinding, richly woven narrative, which plunges, twists and turns at a breathtaking pace, confirms the author as a mistress of storytelling, whose books will be read, reread and read again." 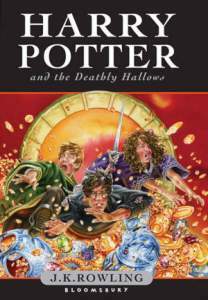 Tytuł: Harry Potter And The Deathly Hallows (child) / Rowling J.k.